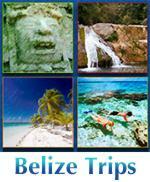 - Overall a low number of tropical storms and hurricanes. - Quiet activity in the Main Development Region & the Eastern Caribbean. - Development close to the US coastline will be a significant threat. - Warmer than average sea surface temperatures in the central Gulf of Mexico ups the antae for a major US landfall. My Analysis: The latest data, including sea surface temperatures, the long, long range forecast guidance and overall instability indicates that a below average number of tropical storms/hurricanes can be expected. Now, with that said, I have significant concerns that the warmer than average ocean water temperatures in the central Gulf of Mexico could lead to a significant to even major hurricane impact on the US Gulf Coast. Now, let’s take a closer look. The latest sea surface temperature and surface pressure forecasts from the European model reveals a pattern that supports a low amount of activity in the deep tropics and the most amount of activity in-close to the United States. The European model surface pressure map for July, August and September shows a forecast of lower than average pressures over the Pacific and northwestern South America and higher than average pressures across much of the Atlantic from the Caribbean eastward to the coast of Africa. This look of the model tells me to expect a lower than average amount of activity across much of the Main Development Region from the coast of Africa to the eastern Caribbean. The ocean water temperature anomaly forecast from the European model shows above average ocean water temperatures across the Gulf of Mexico and off of the US East Coast. This tells me to potentially watch out for in-close development with potential threats/impacts on the US Gulf Coast and along the US East Coast. The current sea surface temperature anomaly map is very revealing as it shows below average sea surface temperatures over the eastern Atlantic and above average sea surface temperatures in the Gulf of Mexico and off of the US East Coast. What is concerning to me is the much above average ocean water temperatures in the central Gulf of Mexico as this could be a factor in leading to any in-close development rapidly intensifying and being a significant to major Gulf Coast hurricane threat. Eastern Atlantic: It appears that the eastern Atlantic east of 50 West Longitude may be quiet this year with below average activity. The ocean water temperatures across the eastern Atlantic are colder than average and it appears that it may remain that way right into much of the Hurricane season. Caribbean: The Caribbean looks to be split with below average activity in the eastern half of the Caribbean and average activity in the western Caribbean. 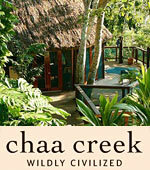 So, for the western Caribbean, development could occur from two sources. The first is from disturbances tracking from the eastern Caribbean into the western Caribbean and the second is from homegrown development from frontal boundaries sinking southward. Gulf Of Mexico: I think that the Gulf of Mexico could be open to tropical cyclone development this hurricane season as it is extremely unusual to have two straight hurricane seasons in a row with no more than one weak tropical storm. In addition, ocean water temperatures in the Gulf of Mexico are already well above average, especially in the central Gulf of Mexico. These above average ocean temperatures in the Gulf of Mexico are forecast to remain above average this summer into the fall and any homegrown type systems coming off of fronts would be able to feed off of these warm waters. 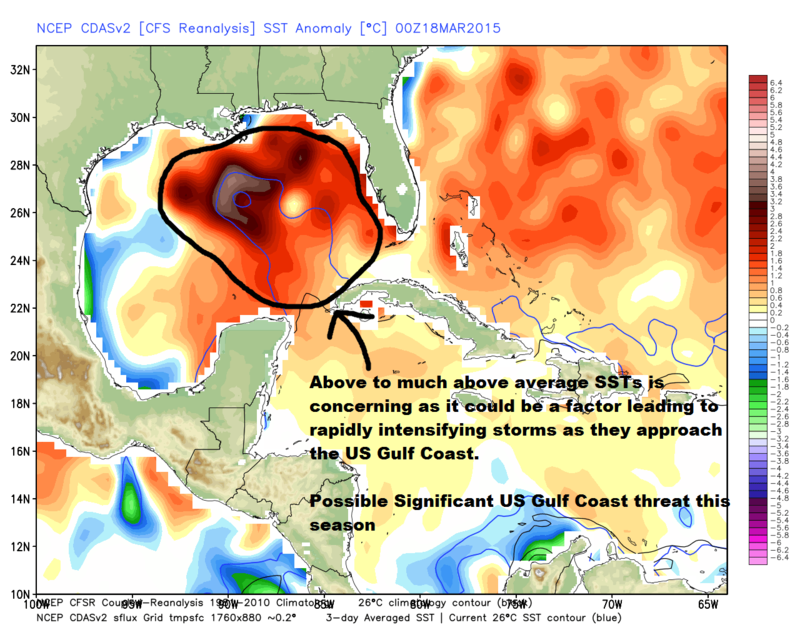 I have concerns for the potential for rapidly intensifying storms as they approach the US Gulf Coast this year. US East Coast & The Bahamas: Ocean water temperatures off of the US East coast and in the Bahamas are forecast to be warmer than average this hurricane season. I think that we will see a fair amount of tropical activity north of where you would normally find development in the deep tropics. This means we will likely see development in close to the US East Coast and near the Bahamas. This would potentially open up the entire US East Coast and the Bahamas to impacts from tropical storms/hurricanes. I think that we will need to watch close to home for those homebrew type systems that form at the end of fronts or from upper level low pressure systems. Conclusion: The 2015 Atlantic Hurricane Season looks like it will be most active in close to the United States and less active in the deep tropics. Early indications continue to support a below average number of tropical storms and hurricanes, but with a pattern that leads to a higher than average threat in the Gulf of Mexico and near the US East Coast. One final point is that it appears that, like last year, we may have storms get stronger the further north it tracks in latitude, especially along and above 25 North Latitude. I will end this by saying that it only takes one to make a season horrible and destructive for any one person. Everyone should prepare for Hurricane season the same exact way each year. Updated forecasts for the 2015 Atlantic Hurricane Season have been issued by Colorado State University and Tropical Storm Risk. I want to briefly go over both forecasts with you and then give you my latest thoughts on what the 2015 Hurricane Season may have in store. Before I get into everything, PLEASE PREPARE for this hurricane season the same way you would for any other season, no matter how many storms are forecast. It only takes one tropical storm or hurricane to make a season very bad for any one person. Find out about your evacuation zone, go out and get shutters to protect your home, go out and go shopping to get hurricane supplies, go to your insurance agent and make sure you are insured properly. Colorado State University’s Updated April 9th Forecast: http://tropical.atmos.colostate.edu/Forecasts/2015/apr2015/apr2015.pdf – The biggest item of note in their forecast is that they are expecting one of the least active seasons in quite some time and that at least a moderate El Niño will be in place during much of the hurricane season. As for numbers, the forecast from Colorado State University is calling for 7 named storms, 3 of those storms becoming hurricanes and 1 of those hurricanes becoming a major hurricane. One item of important note is that a El Niño does not impact the Gulf of Mexico storms and is mainly a impact for the Caribbean and the part of the Atlantic between the Lesser Antilles and the western coast of Africa. This is important and will be discussed more later on in this update. Turning to Tropical Storm Risk’s Updated Forecast: http://www.tropicalstormrisk.com/docs/TSRATLForecastApr2015.pdf – Tropical Storm Risk is forecasting a total of 11 named storms, 5 of those storms becoming hurricanes and 2 of those hurricanes becoming major hurricanes. The main inhibitor for the 2015 Hurricane season could be stronger than average wind shear and cooler than average sea surface temperatures from the Caribbean Sea through the central and eastern Atlantic between the Lesser Antilles and the west coast of Africa. Ok, here are my thoughts on all of this: First and foremost, I am not calling for this season to be quiet, but instead am agreeing with the fact that we are looking at a hurricane season with a low overall number of storms due to a combination of factors including moderate El Niño conditions, cooler than average ocean water temperatures across the Caribbean and the Atlantic between Africa and the Lesser Antilles and a forecast of higher than average wind shear conditions across the Caribbean. The reason why I am not calling for this season to be quiet is because many past seasons with a low number of storms have had a major hurricane landfall on the United States. Some examples are Audrey in 1957, Betsy in 1965, Alicia in 1983, Bob in 1991 and Andrew in 1992. In my opinion, I do think that the Caribbean and the Main Development Region (the area of the Atlantic from the Lesser Antilles to the coast of Africa) will be very hostile to tropical development during the 2015 Hurricane Season. Overall the impact to the Caribbean looks much lower than average this year due to very dry air and cooler than average ocean temperatures from the Caribbean to Africa. 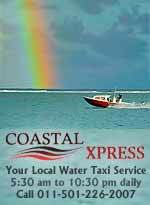 With that said, please still prepare for this hurricane season, in case you are impacted by a tropical cyclone. As for the Gulf of Mexico, the area off of the US East Coast, the Bahamas and Bermuda, I continue to strongly believe that these are the areas that will be the focus for the development of tropical storms and hurricanes this year. In fact, I think that we will see at least one hurricane in the Gulf of Mexico this coming hurricane season. I still think that we will have a quick starting season with the possibility of 1 or even 2 tropical cyclones during June. In fact, one of these June storms may end up making landfall somewhere along the US Gulf coast. This is very analogous to 1957 where we had Hurricane Audrey make landfall on the upper Texas coast and across southwestern Louisiana in late June. One other note is that the ocean water temperatures continue to be very warm around Florida, the Bahamas, and across the Gulf of Mexico. This sort of pattern says to me that we are going to have to watch for tropical development close in to the US coastline. In addition, we may also have to watch out for systems intensifying quickly just before they make landfall, especially in the Gulf of Mexico. Caribbean: Below average activity looks likely across the entire Caribbean this hurricane season with most of the activity potentially occurring north of the Caribbean. In Conclusion: I will end this by saying once again that it only takes one tropical storm or hurricane to make a season very bad for any one person. Please prepare the same way for every season, no matter what. You can prepare by finding out about your evacuation zone, going out and getting shutters to protect your home, going out to shop for hurricane supplies and finally going to your insurance agent and make sure you are insured properly and this includes flood insurance. In their updated forecast released on April 9th, Dr. Phil Klotzbach of Colorado State University put forth several analog years that may be similar in the overall weather pattern & even the potential tracks of this year’s tropical systems. Those analog years are: 1957, 1987, 1991, 1993 and 2014. 1957: The 1957 hurricane season started early with a June major hurricane in the Gulf of Mexico (Audrey) which made landfall along the upper Texas coast and across southwestern Louisiana. Activity quieted down in July into August with only Tropical Storm Bertha making landfall near the Texas-Louisiana state line in early August. During September, we had major hurricane Carrie come very close to impacting Bermuda with Debbie making landfall on the Florida Panhandle as a tropical storm. Also in September, Tropical Storm Esther came ashore in southeastern Louisiana during mid September. 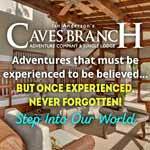 Activity then shut down for the season during October and November. 1987: A tropical depression impacting south Florida and the northern Bahamas during late May started the 1987 hurricane season off early. After that, however, June and July were quiet with no tropical storm or hurricane formations. During August, we had Arlene which was a homegrown tropical system that formed between the northern Bahamas and the coast of southeastern North Carolina. Arlene ended up tracking northeast to east-northeast impacting Bermuda as a tropical storm and then moving out into the open Atlantic. The next impactful storm was Emily in late September which impacted the southern part of the Lesser Antilles as a tropical storm and then tracked into Hispaniola as a Category 3 hurricane. From there, Cindy curved out into the open Atlantic. Finally, Floyd impacted south Florida and the Florida Keys as a Category 1 hurricane during the early part of October. 1991: Hurricane Bob was the big storm for the 1991 hurricane season. Bob was a homegrown type system which formed in the northern Bahamas during August 16th and 17th and then pulled northward and impacted much of eastern and southern New England as a Category 2 hurricane on August 19th. 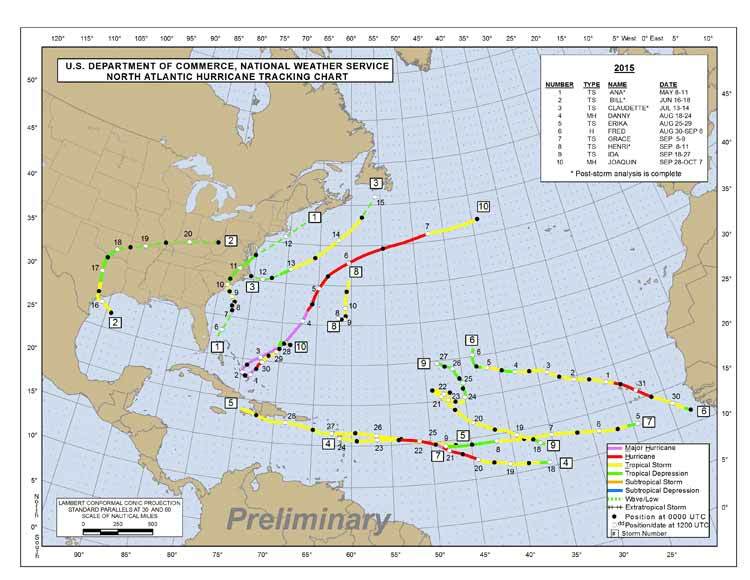 Besides, Bob, there were other impacts during the 1991 hurricane season, including Ana which tracked just offshore of the coasts of South and North Carolina during early July and Fabian which tracked very near the coast of southeast Florida and across the northern Bahamas during mid-October. Finally, let’s not forget the unnamed “Perfect Storm” which formed just off of the Mid-Atlantic and New England coasts around Halloween and brought severe coastal flooding to New England and caused the sinking of the Andrea Gail. 1993: Hurricane Emily was the big storm for the 1993 hurricane season. Emily formed out in the middle of the Atlantic and tracked northwestward for several days before impacting the outer banks of North Carolina on August 31st as a Category 3 hurricane. From there Emily curved east-northeast out into the open Atlantic. Besides Emily, there was Tropical Storm Bret which tracked along the northern coasts of Venezuela and Colombia before making a final landfall in Costa Rica and Panama during early August. Cindy impacted Hispaniola as a tropical storm in mid-August. Gert made landfall near Tampico, Mexico as a Category 2 hurricane in mid-September. 2014: I won’t go over 2014 too much in detail, but instead give you the significant highlights of the season. Arthur impacted eastern North Carolina and the outer banks of North Carolina as a Category 2 hurricane and went on to bring significant wind damage to eastern Maine and parts of Atlantic Canada in early July. Gonzalo unexpectedly impacted the northern Lesser Antilles and the Virgin Islands with significant damage and likely was a hurricane. Gonzalo went on to impact Bermuda as a major hurricane just a few days after Fay brought Bermuda Category 1 hurricane conditions. Here are my thoughts: One big takeaway from all of these analog years is that while there were a low number of overall storms, each of these years had at least one significant hurricane impact somewhere in the Atlantic. This is why the 2015 Hurricane Season is not going to be a “quiet season” as I strongly believe that we will have a major hurricane landfall this year. Given the ocean water temperature anomalies and combined with the analog years presented, four areas are prime candidates for a significant impact from a hurricane. The three areas are (1) along the Gulf Coast from Texas to the west coast of Florida, (2) South Florida and the northwestern Bahamas, (3) Between North Carolina and New England, (4) Bermuda. Please refer to the update I wrote on Thursday which broke down the potential threat region by region. We deserve a year of no storms. Thank you. It should be another quiet Atlantic hurricane season in 2015, and the active hurricane pattern that began in 1995 may now be over, said NOAA in their May 27 seasonal hurricane forecast. They give a 70% chance of a below-normal season, a 20% chance of a near-normal season, and only a 10% chance of an above-normal season. They predict a 70% chance that there will be 6 - 11 named storms, 3 - 6 hurricanes, and 0 - 2 major hurricanes, with an Accumulated Cyclone Energy (ACE) 40% - 85% of the median. If we take the midpoint of these numbers, NOAA is calling for 8.5 named storms, 4.5 hurricanes, 1 major hurricane, and an ACE index 62.5% of normal. This is well below the 1981 - 2010 average of 12 named storms, 6 hurricanes, and 3 major hurricanes. Hurricane seasons during the active hurricane period 1995 - 2014 averaged 14.7 named storms, 7.6 hurricanes, and 3.5 major hurricanes, with an ACE index 142% of the median. Only three seasons since 1995 have been classified by NOAA as being below normal--including two El Niño years (1997 and 2009), and the neutral 2013 season. - By creating high levels of wind shear over the tropical Atlantic, which tends to tear storms apart. - By increasing sinking motion and high pressure over the tropical Atlantic. 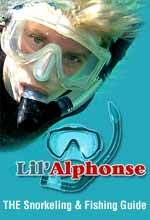 - By making the air more stable over the tropical Atlantic. 2) Near-average sea surface temperatures (SSTs) are in place over the hurricane Main Development Region (MDR), from the Caribbean to the coast of Africa between between 10°N and 20°N. These SSTs are expected to be near or below average during the peak August - October portion of hurricane season, and are expected to be cooler than SSTs in the remainder of the global tropics (SSTs in the remainder of the global tropics were 0.31°C warmer than SSTs in the MDR in May.) 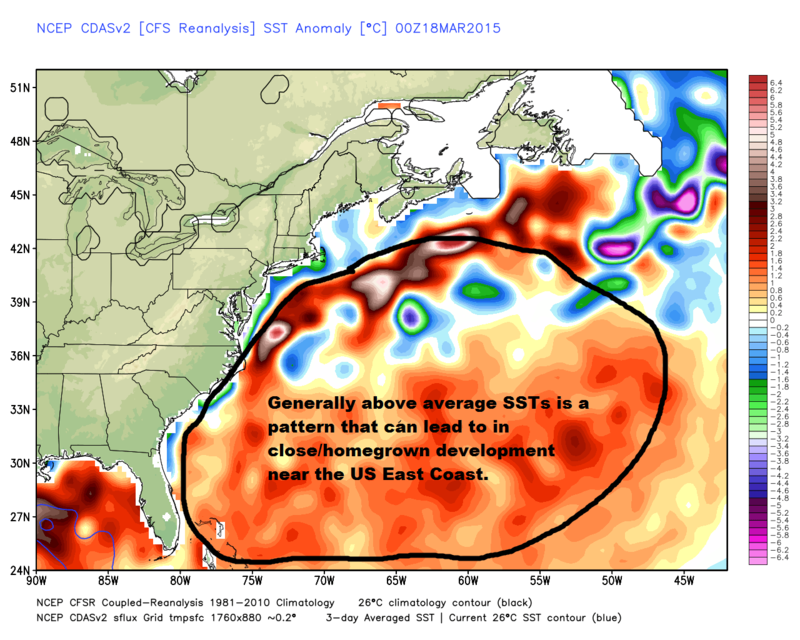 This configuration of SSTs is often quite hostile to Atlantic tropical cyclone development. 3) The active period of hurricane activity that began in 1995 due to a natural decades-long cycle in hurricane activity called the Atlantic Multi-decadal Oscillation (AMO) may now be over. The SST pattern associated with that cycle is absent this year, and NOAA said: "There have been two seasons in a row, 2013 and 2014, with below-normal and near-normal activity respectively and neither had an El Niño event responsible for the reduced activity. The current configuration of SSTs in the Atlantic Ocean, both in the MDR and the entire North Atlantic, are suggestive that the AMO may no longer be in the warm phase." Figure 1. 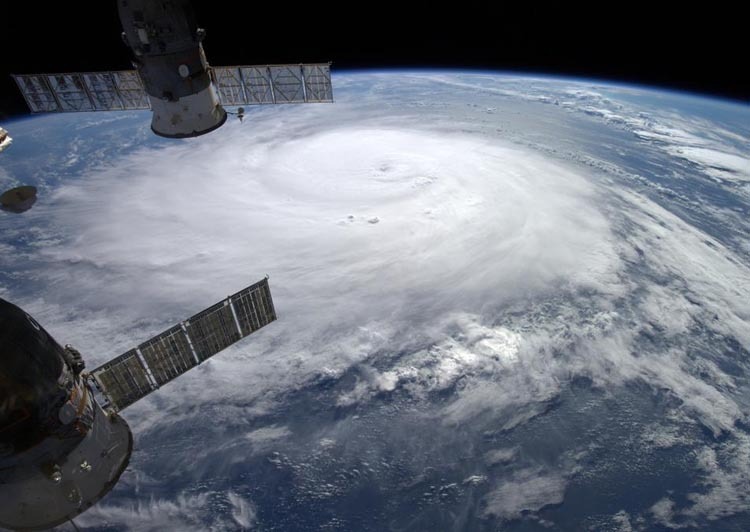 Hurricane Gonzalo as seen from the International Space Station on October 16, 2014. 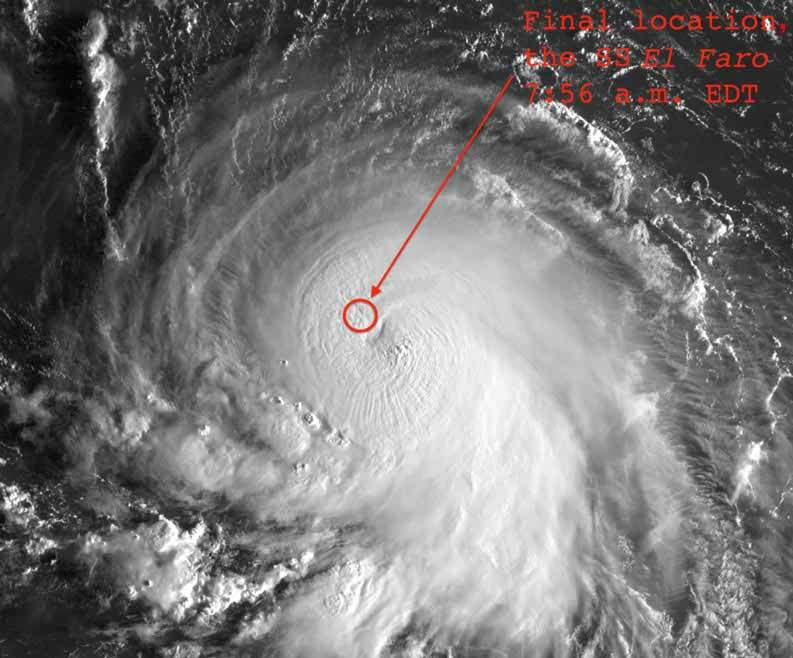 At the time, Gonzalo was at peak strength, with 145 mph winds, and was the first Atlantic hurricane to reach sustained winds of at least 145 mph since Hurricane Igor of 2010. Gonzalo hit Bermuda just a week after Hurricane Fay hit the island, and Gonzalo's remnants went on to batter the United Kingdom on October 21 with wind gusts exceeding 100 mph, killing three people there. Image credit: Alexander Gerst. Though hurricane activity in the MDR should be limited this year, we often see storms occurring in a belt extending from the Gulf of Mexico to the central Atlantic north of the MDR during El Niño years, in association with reduced vertical wind shear across the region (Goldenberg and Shapiro 1996). NOAA's long-range CFS model predicts the vertical wind shear in this belt to be weaker than average during the August - October peak of hurricane season, which could allow activity to be near the higher end of their predicted ranges (11 named storms, 6 hurricanes, and 2 intense hurricanes.) At present, SSTs are unusually warm in the Gulf of Mexico (1°C - 3°C above average) and in a belt from the Bahamas eastward into the central Atlantic (1 - 2°C above average). Storms that form in these waters are typically weaker than ones that form in the MDR, since they have less time to intensify over warm water. Standard disclaimer: “A below-normal season doesn’t mean we’re off the hook. As we’ve seen before, below-normal seasons can still produce catastrophic impacts to communities,” said NOAA Administrator Kathryn Sullivan, Ph.D., referring to the 1992 season in which only seven named storms formed, yet the first was Andrew – a Category 5 Major Hurricane that devastated South Florida. Figure 2. 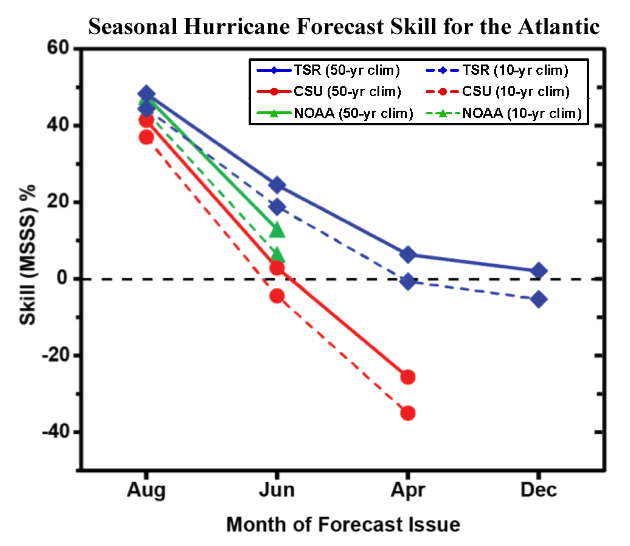 Forecast skill of the TSR, NOAA (National Oceanic and Atmospheric Administration) and CSU (Colorado State University) for the number of hurricanes in the Atlantic during 1980 - 2014, as a function of lead time. Forecast precision is assessed using the Mean Square Skill Score (MSSS) which is the percentage improvement in mean square error over a climatology forecast (six hurricanes in a given year.) Positive skill indicates that the model performs better than climatology, while a negative skill indicates that it performs worse than climatology. Two different climatologies are used: a fixed 50-year (1950-1999) climatology, and a running prior 10-year climate norm (2005 - 2014). NOAA does not release seasonal outlooks before late May, and CSU stopped providing quantitative extended-range December hurricane outlooks in 2011. Skill climbs as the hurricane season approaches, with modest skill levels by early June, and good skill levels by early August. Using this metric, NOAA's late May forecasts have about 10% skill over chance, while TSR's have about 20% skill. Image credit: Tropical Storm Risk, Inc (TSR). The May 27 forecast for the 2015 Atlantic hurricane season made by British private forecasting firm Tropical Storm Risk, Inc. (TSR) will be out later today, and I will update this post with their latest numbers. Their April 9 forecast called for 11 named storms, 5 hurricanes, 2 intense hurricanes, and an Accumulated Cyclone Energy (ACE) of 56. Another quiet Atlantic hurricane season is likely in 2015, said the hurricane forecasting team of Dr. Phil Klotzbach and Dr. Bill Gray of Colorado State University (CSU) in their latest seasonal forecast issued April 9. They called for an Atlantic hurricane season with 7 named storms, 3 hurricanes, 1 intense hurricane, and an Accumulated Cyclone Energy (ACE) of 40. The next CSU forecast is due on Monday, June 1, and will receive a lot of media attention. My April 9 blog post has more on their forecast. The UKMET office forecast for the 2015 Atlantic hurricane season, issued May 21, calls for below-normal activity, with 8 named storms, 5 hurricanes, and an ACE index of 74 occurring during the period June - November. If we add in Tropical Storm Ana, these numbers come out to 9 named storms and 5 hurricanes. In contrast to the statistical models relied upon by CSU, TSR, and NOAA, the UKMET forecast is done strictly using a dynamical global seasonal model, the Met Office GloSea5 system. The May 27 forecast from the private weather firm WSI (part of The Weather Company, along with The Weather Channel, Weather Central, and The Weather Underground), is calling for a quiet Atlantic hurricane season with 9 named storms, 5 hurricanes, and 1 intense hurricane. WSI cites the expectation of El Niño conditions this fall as a key factor influencing their forecast. The May 11 forecast made using a statistical model by Penn State's Michael Mann and alumnus Michael Kozar is calling for a quiet Atlantic hurricane season with 8 named storms, plus or minus 2.7 storms. Their prediction was made using statistics of how past hurricane seasons have behaved in response to sea surface temperatures (SSTs), the El Niño/La Niña oscillation, the North Atlantic Oscillation (NAO), and other factors. The statistical model assumes that in 2015 the mid-May -0.18°C departure of temperature from average in the MDR will persist throughout hurricane season, the El Niño phase will be moderate, and the North Atlantic Oscillation (NAO) will be near average. 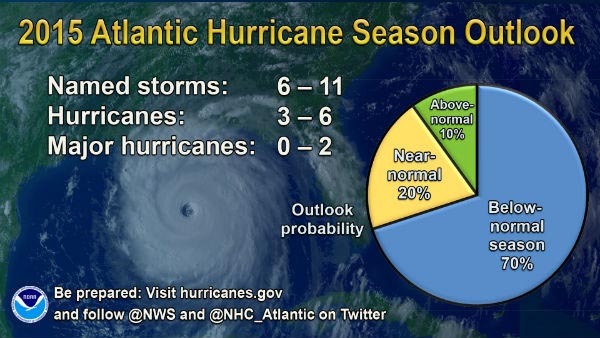 The April 19 forecast from North Carolina State University (NCSU), is calling for a below-average Atlantic hurricane season with 5 named storms, 2 hurricanes, and 1 intense hurricane. The April 17 forecast from Coastal Carolina University is calling for a below-average Atlantic hurricane season with 8 named storms, 4 hurricanes, and 2 intense hurricanes. The May 4 forecast from the Cuban Meteorological Service, INSMET, is calling for a below-average Atlantic hurricane season with 9 named storms and 3 hurricanes. The forecast is based on a statistical prediction model developed by Ballester, González and Pérez (2010). Figure 3. Departure of temperature from average for May 23 for the Northeast Pacific waters showed large areas of SSTs 1 - 2°C (1.8 - 3.6°F) above average. Image credit: NOAA/NHC. NOAA's pre-season prediction for the Eastern Pacific hurricane season, issued on May 27, calls for an active season, with 15 - 22 named storms, 7 - 12 hurricanes, 5 - 8 major hurricanes, and an ACE index 110% - 190% of the median. The mid-point of these ranges gives us a forecast for 18.5 named storms, 9.5 hurricanes, and 6.5 major hurricanes, with an ACE index 150% of average. The 1981 - 2010 averages for the Eastern Pacific hurricane season are 15 named storms, 8 hurricanes, and 4 major hurricanes. NOAA's pre-season prediction for the Central Pacific hurricane season, issued on May 27, calls for an above-average season, with 5 - 8 tropical cyclones. 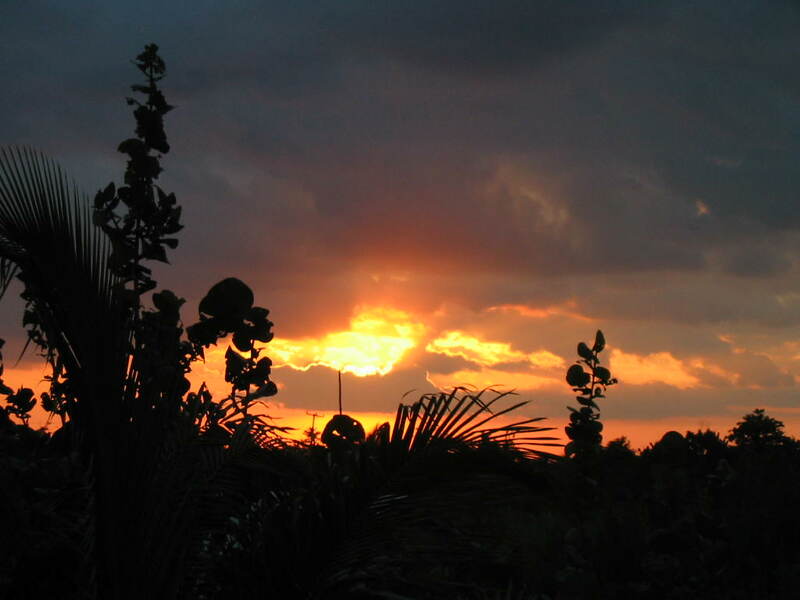 An average season has 4 - 5 tropical cyclones, which include tropical depressions, tropical storms, and hurricanes. Hawaii is the primary land area affected by Central Pacific tropical cyclones. The May 6 forecast for the 2015 Northwest Pacific season made by British private forecasting firm Tropical Storm Risk, Inc. (TSR) calls for an active season with 27 named storms, 17 Category 1 or stronger typhoons, 11 intense Category 3 or stronger typhoons, and an Accumulated Cyclone Energy (ACE) of 400. The long-term averages for the past 50 years are 26 named storms, 16 typhoons, 8 intense hurricanes, and an ACE of 294. TSR rates their skill level as modest for these late May forecasts--13% - 28% higher than a "no-skill" forecast made using climatology. TSR’s main predictor for their typhoon season forecast is sea surface temperature (SST) in the region 5 ̊S - 5 ̊N, 140 ̊W - 180 ̊W, which they expect to be 1.0±0.5°C warmer than normal. The first named storm of the Northeast Pacific hurricane season usually forms by June 10, but we are likely to see Tropical Storm Andres well before that date this year. Satellite loops show that Invest 92E, located about 800 miles south-southwest of Manzanillo, Mexico, has developed a large area of heavy thunderstorms and a good degree of spin. The GFS and European models both show 92E developing into a tropical depression or tropical storm by Saturday. SSTs are a very warm 30°C (86°F), which is nearly 2°C (3.6°F) above average. The 8 am EDT Wednesday SHIPS model forecast predicted that wind shear would remain light over 92E during the coming five days, and I expect 92E will develop into Tropical Storm Andres by early next week. In their 2 pm EDT Wednesday Tropical Weather Outlook, NHC gave 92E 2-day and 5-day development odds of 80% and 90%, respectively. This system is far enough offshore that it will not spread heavy rains to the coast of Mexico over the coming week as it moves west-northwest or northwest, parallel to the coast. In the Atlantic, the models are depicting high wind shear through June 3 over the majority of the regions we typically see early-season tropical cyclone development--the Caribbean, Gulf of Mexico, and Bahamas. However, late next week we should see a decrease in wind shear, which would argue for an increased chance of tropical storm development then (though wind shear forecasts more than 7 days in advance are highly unreliable.) The prospects for an early June Tropical Storm Bill developing in the Gulf of Mexico or waters near the Bahamas are above average, given the warmer than average SSTs in these waters, and the fact that the Madden-Julian Oscillation (MJO) is expected to be active in the Western Hemisphere during the first ten days of June. Today, Monday 1st June marks the start of the 2015 hurricane season. Projections from the more reputable organizations that produce hurricane seasonal outlooks indicate that a below average to near average activity is likely this season. In terms of named systems the range runs from as low as 6 to a high of 11 named systems. The average number of named systems for the 1981 to 2010 period is 12. The range for hurricane activity predicted for 2015 lies between 3 and 6. These reflect values at and below the average of 6 hurricanes. Outlooks on intense hurricane activity, i.e category 3,4 and 5, indicate between 1 and 2 major hurricanes. The average number of major hurricanes is 2. The predictions for an average season can be attributed to two factors. Firstly the el Niño phenomenon which is the abnormal warming of the Pacific Ocean, usually has a suppressing effect on tropical cyclone activity in the Atlantic Basin. That phenomenon has a high probability of developing and reaching moderate intensities during this season. Secondly, the source of energy for tropical cyclones is the warm ocean temperatures. 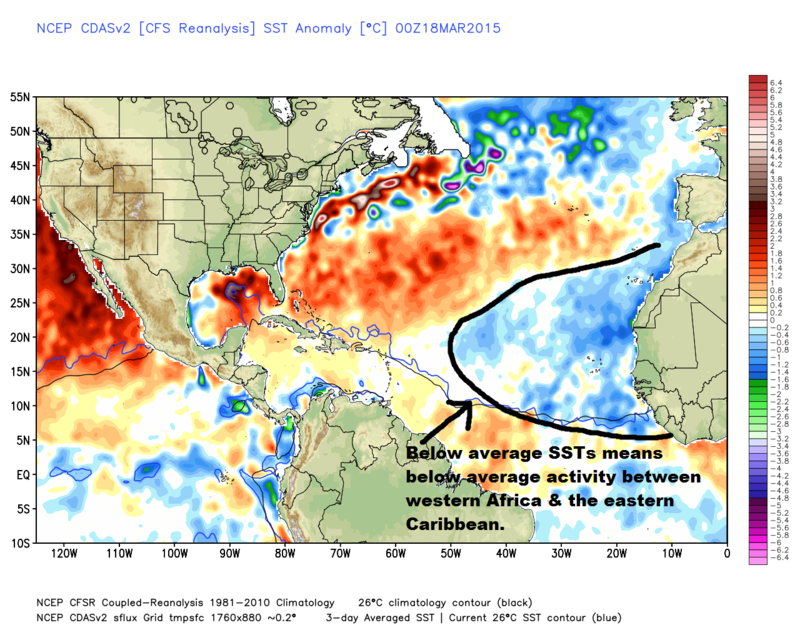 Sea surface temperatures in the tropical Atlantic and Caribbean Sea are also forecast to be just about average. The numbers as indicated in the seasonal outlooks do not tell the full story. Seasonal outlooks do not tell where the tropical cyclones could make landfall or the number of hits any one particular location could experience. It is worthwhile to note that regardless of the activity predicted in the seasonal outlooks it takes only one system to create a disaster. Such disasters can happen whether the season is very active or relatively quiet Therefore the same level of preparation is required for this 2015 season as would be done if the forecasts called for an active season. 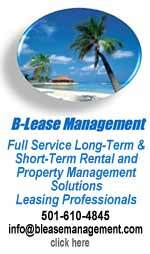 It is being emphasized as per normal proper planning and preparations are the keys to preserving life and property. During the past off-season the National Meteorological Service has continued in its quest to be ever more prepared for any eventuality. The Service has been performing “in-house” testing of the regional Weather Research and Forecast (WRF) model and plans to make the products publically available soon. The WRF has been modified to focus directly over Belize. This model will be able to resolve and forecast weather systems within 9 to 10 mile distances as opposed to the resolution of 18 to 20 miles presently received from the global models being used operationally. This development will greatly improve on the forecasting capabilities of the National Meteorological Service. In addition, the network of observation stations is being retrofitted with automatic weather stations capable of providing near real-time weather information to forecasters. We, the staff of the National Meteorological Service, with preparations firmly in place, will once again be performing at our utmost best to provide you, the public, with accurate and timely information on all systems that could impact on our nation. Have a safe 2015 hurricane season. The 2015 hurricane season began today and in recognition of the potential threats that might be faced during the upcoming months, the City Emergency Management Organization (CEMO) held its yearly press conference at City Hall to discuss noteworthy hurricane preparedness strategies for city residents, as well as its plans in case of any such natural disaster. According to CEMO chairman, Mayor Darrell Bradley, the organization commenced its preparations in January of this year when the 13 hurricane shelters across Belize City underwent inspections to evaluate their readiness. Bradley said that the primary purpose of the shelters – which include 5 on the north side and 8 on the south side of the city – is for “safety and not comfort”, and if there is a need to use these structures, they will be opened on an incremental basis depending on the severity of the storm. One major concern relating to those shelters is the sturdiness of the structure, and therefore, CEMO Liaison Officer, Wayne Usher, emphasized that the inspections were carried out by technical advisors from the Housing Department, the Fire Department, and the Ministry of Health, as well as an engineer and a representative of the National Emergency Management Organization (NEMO) who, he said, were satisfied that all aspects, including the structural integrity, of the buildings, were able to withstand up to a category 2 hurricane. If it so happens that the storm develops into a category 3 or stronger, then mandatory evacuation might be requested, the officials said. A phenomenon that is also being looked at is the potential for flooding in the low-lying areas of the city. This was elaborated on by City Councilor responsible for Emergency Management, Philip Willoughby. Those measures, he cited, consist of enacting flood mitigation projects and creating emergency evacuation routes via monthly meetings between CEMO and NEMO personnel. CEMO officials have also stressed that the cooperation of the public in efforts at natural disaster preparedness is a key factor, and citizens were advised to be proactive in ensuring that they have a hurricane plan for their families, as well as adequate supplies, such as food and water, in case of a storm. That issue was addressed because Bradley mentioned that those who are employed tend to request time off from work to gather their provisions when the storm is approaching; however, the ideal approach is to have all the necessary food items and other supplies prior to the approach of a hurricane. Although CEMO officials have maintained that they are geared up for any possible scenario this hurricane season, one issue that remains to be addressed involves the special attention or medication that is required by ailing or special needs individuals who might be staying at the various hurricane shelters, since no plan has yet been drafted to manage those cases. In case of a storm, CEMO has advised all city residents to stay tuned to the regular reports from the local meteorological service, and those who plan to go to the shelters are asked to take at least three days’ supply of food, water and other necessities. 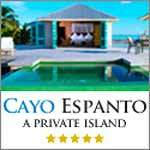 Of note is that the emergency family plan and the list of hurricane shelters in Belize City are listed on the websites of CEMO and the Belize City Council. Today marks the end of the 2015 Hurricane Season and it is safe to say that our country did not face any threats this year. And this is because the season was below average, says Chief Meteorologist Dennis Gonguez. The below average Hurricane season this year was caused by the El Nino effect, next year however, the season will go back to normal. Despite the below average hurricane season, Belize did experience flooding caused by heavy rainfall, due to a small scale system which generated in Mexico and affected the northern part of the country. According to Gonguez, the public should start preparing for the next hurricane season, as threats maybe ahead. The 2015 Atlantic hurricane season is officially over, and it will go into the books as the most memorable hurricane season to occur during a strong El Niño event. Strong El Niño events typically reduce Atlantic hurricane activity by increasing wind shear over the tropical Atlantic, and this year's El Niño conditions did indeed create unusually high levels of wind shear over the Caribbean, making it difficult for tropical systems to organize and strengthen in those waters. 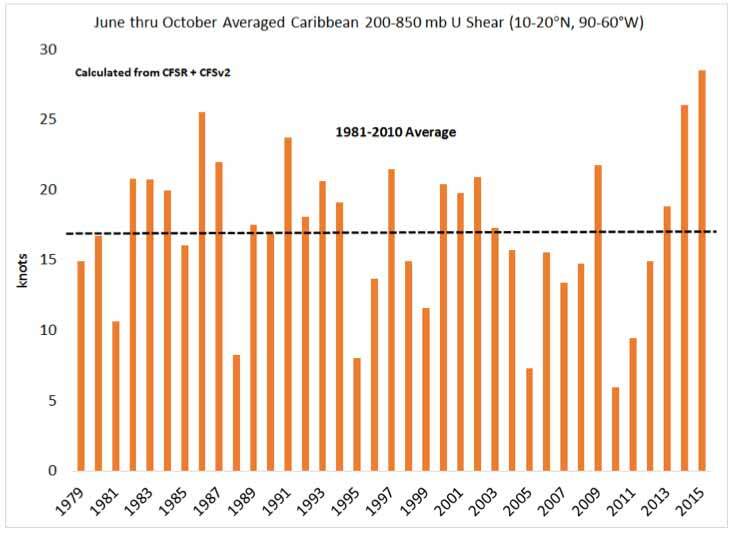 According to Colorado State's Dr. Phil Klotzbach, the 200-850-mb vertical wind shear in the Caribbean (10-20°N, 90-60°W) averaged from June through October was the highest since at least 1979 (28.5 knots.) However, this high wind shear did not extend as far east as usual, allowing several tropical storms to form near the coast of Africa over waters that were near-record warm. Near record-warm to record-warm ocean temperatures were also over more northern reaches of the Atlantic, and helped spur the formation of Hurricane Joaquin and Hurricane Kate. As a result, the 2015 season was able to tally numbers that were not that far below average--11 named storms, 4 hurricanes, and 2 intense Category 3 or stronger hurricanes. The 1981-2010 average numbers were 11.5 named storms, 6.1 hurricanes, and 2.6 major hurricanes. Accumulated Cyclone Energy (ACE) is a measure of the total destructive power of a hurricane season, based on the number of days strong winds are observed. ACE for an individual storm is computed by squaring the maximum sustained winds of the storm at each 6-hourly advisory, and summing up over the entire lifetime of the storm. The ACE for the 2015 Atlantic hurricane season was about 60% of average, reflecting the relative lack of hurricanes. Hurricane Joaquin accounted for 46% of the season's ACE. Figure 1. Preliminary paths of all the named Atlantic storms of 2015, except for Hurricane Kate, which has not yet been added. Image credit: NOAA/NHC. 1) Hurricane Joaquin was the strongest Atlantic hurricane since 2007, topping out just below Category 5 strength on October 3 with 155 mph winds. Joaquin was the second deadliest and second most damaging Atlantic named storm of 2015, causing $100 million in damage in the Central Bahamas, where it lingered for several days. Joaquin's death toll was 35, with 33 of these deaths occurring from the sinking of the ill-fated cargo ship El Faro. Although Joaquin tracked far to the east of the United States, a non-tropical low over the Southeast tapped into the hurricane's moisture, causing record-shattering rains and flooding across North and South Carolina. Several areas of South Carolina saw accumulations exceeding the threshold for a 1-in-1,000-year event. The subsequent floods inundated large areas of the state, killing 19 people and causing over $2 billion in damage. Figure 3. Hurricane Joaquin as seen by the GOES-East satellite at 7:45 am EDT October 1, 2015. At the time, Joaquin was an intensifying Category 2 storm with 110 mph winds. The last position of the cargo ship El Faro, in the northwestern eyewall of Joaquin, is shown. 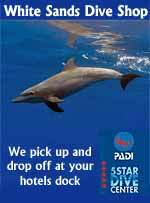 Image credit: United States Navy and NOAA. 2) Tropical Storm Erika was the deadliest and most expensive Atlantic storm of 2015. Erika unleashed a catastrophic deluge on August 27 that brought extreme flooding to the Caribbean island of Dominica (population 72,000), causing its most expensive disaster in history. The storm did $612.7 million in damage in East Caribbean dollars to roads and bridges, $39.5 million in damage to the airport, and an additional $12 million in clean up costs (thanks go to David C. Adams of Thomson Reuters for this info.) Erika's total preliminary price tag of $275 million U.S. dollars is not far from Dominica's annual GDP of $500 million. 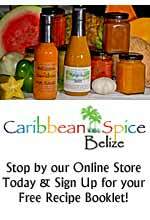 The storm will likely set the island back 20 years in development, Prime Minister Skerrit said. According to EM-DAT, the international disaster database, Dominica's previous most expensive disaster was the $175 million in damage from Hurricane Marilyn of 1995. Erika's death toll of 36 makes it the 3rd deadliest disaster in Dominica's history, behind the 40 killed in 1979's Hurricane David and the 2,000 people killed in Dominica by The Dominican Republic Hurricane of 1930. Video 1. Floodwaters rage through a street on Dominica island in the Caribbean on Thursday, August 27, 2015, after Tropical Storm Erika dumped 12+" of rain on the island. 3) Hurricane Fred. For the first time since 1892, a full-fledged hurricane pounded the Cape Verde islands, when Hurricane Fred intensified to a Category 1 storm with 85 mph winds as it passed through the islands on August 31. Fortunately, Fred missed making a direct hit on any of the islands, and damage was less than $2 million. However, Fred brought violent seas to the West African coast, damaging or destroying numerous fishing villages in Senegal. Between the coasts of West Africa and Cape Verde, maritime incidents related to Fred resulted in 9 deaths (Wikipedia.) Fred became a hurricane at 22.5°W longitude, the easternmost formation location in the tropical Atlantic for any hurricane in the historical record. The previous record was held by Hurricane Three of 1900, which became a hurricane at 23°W, south of the Cape Verde islands. Figure 4. MODIS image of Hurricane Fred from NASA's Terra satellite taken at approximately 11:15 am EDT Monday August 31, 2015. At the time, Fred was at peak strength with top sustained winds of 85 mph. Image credit: NASA. 4) No major hurricanes made US landfall in 2015. The last major hurricane to make US landfall was Wilma (2005), so the US has now gone ten years without a major hurricane landfall. In records going back to 1851, the US has never had a ten-year period without a major hurricane landfall, eclipsing the previous record of eight years set from 1861-1868. 5) Florida went without a hurricane impact for the 10th consecutive year. This is the longest consecutive year period on record that Florida has not had a landfall since records began in 1851. The longest previous record was five years, set from 1980- 1984. 6) Ocean temperatures in the Caribbean were the warmest on record in October, yet no storms formed in the Caribbean and only one (Erika) tracked into the Caribbean. This is because June-October-averaged 200-850-mb vertical wind shear in the Caribbean (10-20°N, 90-60°W) was 28.5 knots--the strongest on record (since 1979). 7) Hurricane Danny. Despite strong El Niño conditions developing in the Eastern Pacific, a major hurricane managed to form in the Main Development Region (MDR) of the tropical Atlantic, between the coast of Africa and the Caribbean. 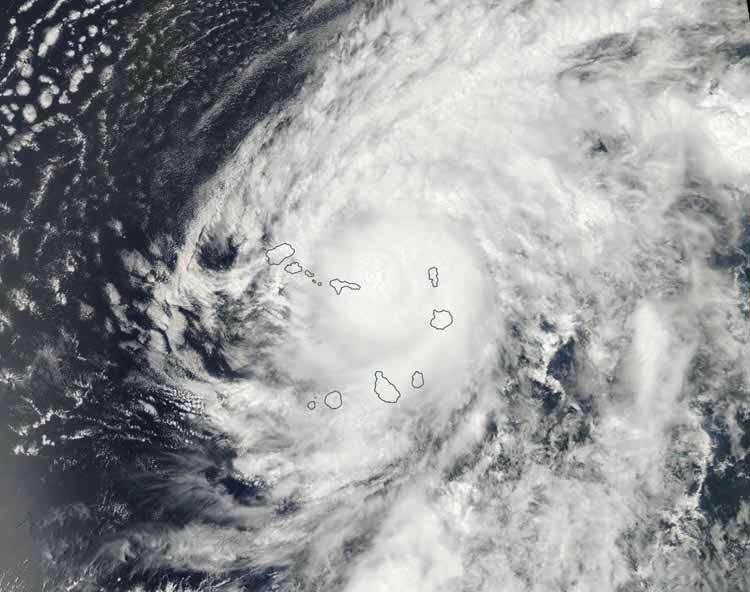 Hurricane Danny only lasted six hours as a major hurricane, and high wind shear and dry air destroyed the storm just as it arrived in the Lesser Antilles Islands. Figure 5. Hurricane Danny as viewed from the International Space Station and tweeted on Thursday morning, August 20, by astronaut Scott Kelly. At the time, Danny was an intensifying Category 1 hurricane with 80 mph winds. Image credit: NASA. 8) Only four hurricanes formed in 2015. This brings the combined 2013-2015 total to 12 hurricanes. This is the lowest three-year total since 1992-1994 (11 hurricanes). 9) Two major hurricanes formed in 2015. This brings the combined 2013- 2015 total to 4. No three-year average has been lower since 1992-1994 (2 major hurricanes). 10) Hurricane Kate became the Atlantic’s most intense tropical cyclone on record for November during the five years since 1950 with strong El Niño conditions present in October-December: 2015, 1997, 1982, 1972, and 1965. Only one other named system was observed during those Novembers: 1972’s Subtropical Storm Delta. Video 1. WU member Brian Osborne created this impressive 18-minute long video of over 10,000 GOES-East images showing the evolution of the 2015 Atlantic hurricane season. Particularly interesting is the portion about 12 minutes in, when we see Hurricane Joaquin form, plow into the Central Bahamas, then turn a firehose of moisture into South Carolina that gets wrapped around an upper-level low pressure system.